My name is Carlos and my wife and partner’s name is Yolanda. We are two young Marine Biologists in love with our Island, Puerto Rico and we hope to share with you the natural beauty of its shores and surrounding waters. We have designed a series of aquatic eco-excursions so that visitors (and locals) to our “Isla del Encanto” can experience for themselves the incredible variety of animal and plant-life that these very special and fragile, tropical ecosystems support. As our guest, you become a Pure Adventurer, because the beaches we visit, the lagoons that we kayak, the bioluminescent waters that we explore and the seas where we snorkel and dive are all pristine, relatively untouched environments. We know that you will be amazed and delighted by your adventure and that it is our hope that you take home with you a newfound conviction of how incredibly important it is that we protect our earth’s natural resources so that our children and generations to come can enjoy and appreciate what we have today. 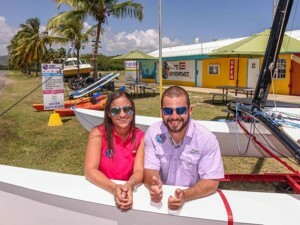 Both founders of Pure Adventure share a combined experience of over 10 years in the eco-adventure industry and both have Bachelor degrees of Coastal Marine Biology at the University of Puerto Rico at Humacao. 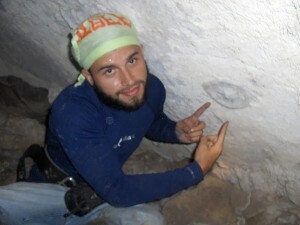 Carlos and Yolanda make every effort to personally guide each excursion. Step out of the ordinary and into the extraordinary. Experience fun in the sun like never before with a variety of water sport activities that will leave you with a lifetime of incredible memories. Pure Adventure’s Dive & Snorkel Center has a variety of vessels and water sport equipment for both renting and taking tours. 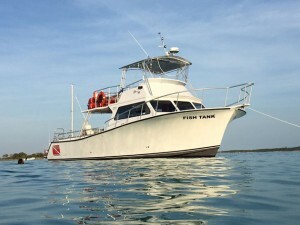 Perfect for exploring the reefs and local wonders of Fajardo, Culebra, Vieques, and the former naval base, Roosevelt Roads. “Fish Tank” – a diver’s dream boat! This powerboat is every diver’s dream. A USCG certified 46ft Newton custom dive boat, equipped with: a pair of 405hp Cummings, two dive ladders, fresh water shower, and a fly bridge. Additionally there’s a DAN oxygen unit, radio (get your IPOD), GPS & VHF. “Fish Tank” is specially designed and built to provide all the amenities possible for the divers and snorkelers. Fish Tank” makes every diving experience more pleasant, with plenty of room for every diver on every cruise and dive trip. 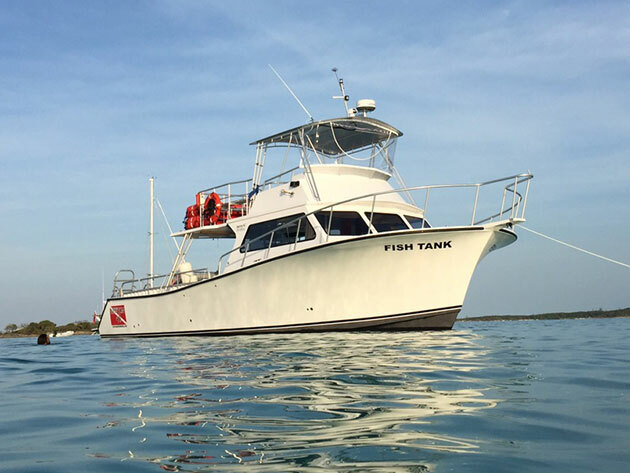 This dive boat will help you achieve the dive/snorkel experience you’re looking for – a comfortable boat ride, easy access to the dive spot and great crew! 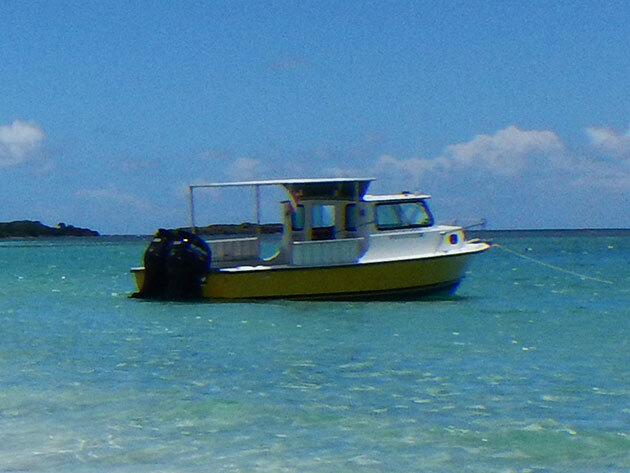 “Happy Hour” – our Snorkel & Cruise boat! “Happy Hour” is a 25’ Pilot House equipped with a pair of 150hp 4 stroke engines, a rooftop providing plenty of shade, VHF, GPS, fish finder, radio (bring your IPOD), and a dive ladder. The boat carries all required safety equipment by the USCG and the latest navigation instruments, identification cards, all helping to safeguard a unique experience. “Happy Hour” is perfect for island hopping and private charters. With a maximum of 6 guests, this snorkel boat is the perfect vessel for snorkel and beach exploration. Because of its perfect size and shallow draft “Happy Hour” takes our guests to secluded, rarely visited beaches and coves where larger boats don’t go. The “Good Vibes” is a 16 ft Hobie Cat, with all its gear in great condition and a brand new trampoline. The ‘16’ is the most popular Hobie Cat since it can be used for both, recreational and racing purposes. 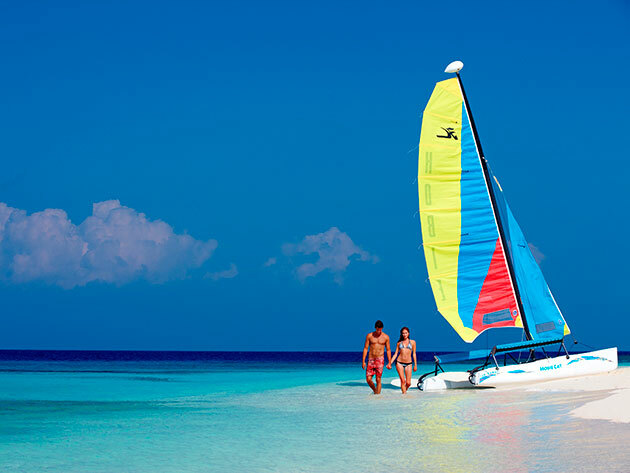 Our sailboat is perfect for couples that are looking to feel the rush of the trade winds that caress the eastern shores of Puerto Rico. Set sail with a P.A. skipper as you visit cays and beaches while enjoying panoramic views of mainland mountains and surrounding Islands. Pure Adventure counts with a fleet of both tandem and single, user-friendly kayaks. 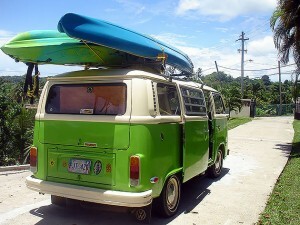 All are equipped with backrests for comfort, life vests for safety and paddles. Our location provides perfect conditions for snorkeling, beach exploration and bird watching. Pure Adventure’s Dive & Snorkel Center has a variety of paddleboards so you can practice the ancient sport, testing your balance and skills, all in the calm waters surrounding the bays and inlets of Roosevelt Roads on the eastern shores of Puerto Rico. Our kayak, snorkel and dive excursions are different because, not only do our adventurers have fun, most of them are guided by a trained Marine Biologist devoted to educating and informing you by describing the ecosystems and identifying the animal and plant life that inhabit them. Pure Adventure means the purest of all adventures! Our Snorkeling, Kayaking and Diving venues are “off the beaten track”. That’s why when you explore with us, many times we are virtually alone in any given environment, whether it be a little known lagoon, a secluded, hidden beach or a secret dive spot. Most of the Pure Adventure excursions are located on the eastern coast of Puerto Rico (between the Humacao and Fajardo municipalities). 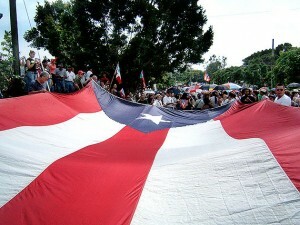 Our guests will also learn about the history and culture of Puerto Rico. Your guides will describe the blend of ethnic cultures that have inhabited Puerto Rico through the centuries. From the indigenous Taino tribes to the arrival of the Spanish conquistadors and the subsequent introduction to the Island of African slaves to work the cane fields in the 19th century. Our Island has a rich and varied past. And in keeping with the Puerto Rican theme, Pure Adventure serves only authentic, healthy, local in-season fruits and delicacies. So, not only will you learn about our culture, we’ll make sure that you savor it also! Our team and equipment is first class. Every Pure Adventure guide is well trained in CPR/First Aid, Oxygen Administration and Rescue Management. All Adventure Guides are equipped with a marine radio and first aid & CPR kit. In every kayak/snorkeling excursion each of the lead guides carry a rescue tube. 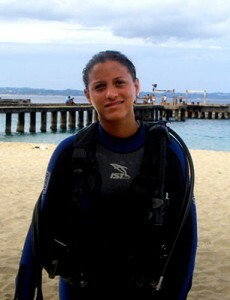 In every diving excursion, your Adventure Guide will always carry an oxygen administration kit. Before every excursion the Pure Adventure team consults the latest weather forecasts 24 hours before departure time. The safety of our guests is our priority in every Adventure. There is ALWAYS a guide in the water, nearby, with you. Our Excursions make people silly! We believe that the gear does make the difference! For this reason we provide the best and safest gear from recognized brands. All equipment is periodically inspected and renewed. So you don’t have to worry about a leaky mask! Our kayaks are very seaworthy craft. Proven to be safe for those that have taken the time to learn the basic skills. Before each Kayaking excursion, your Pure Adventure guide will instruct our guests on the techniques of safe kayak handling. All of our ocean kayak routes are conducted in protected waters where barrier reefs reduce wave action. Every Pure Adventure guide carries a First Aid Kit. Every Pure Adventure guide is equipped with a CPR mask and Rescue Device (Rescue Tube). Before every excursion the Pure Adventure team consults the latest weather forecasts 24 hours before departure time. With us you get an up-close experience with the natural aquatic world that will fill you with amazement, providing memories for a lifetime! To know, that in every day, there is a new experience in nature to learn from. To inter relate with our guests from different cultures from all around the world. 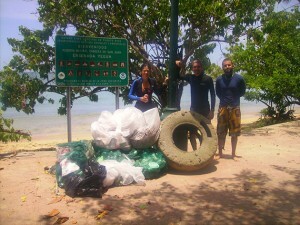 To strive to be as ECO friendly as possible because our Island and future generations depend on us. 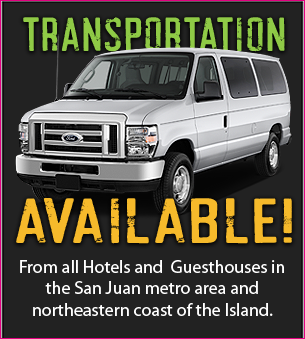 To provide outstanding service to our valued, adventurous guests. To motivate our guests to become stewards of conservation, to protect our earth’s natural eco-systems wherever they may travel. To further our studies and trainings to better understand the amazing natural, aquatic world and to pass along our knowledge to the youth of Puerto Rico. To make a difference and give our best! All images Copyright © 2008 Pure Adventure Corp. All rights reserved.